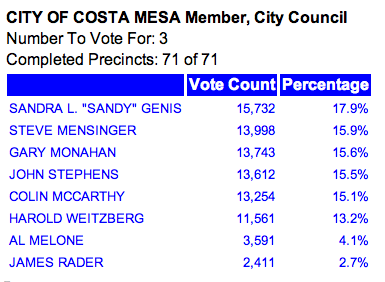 Sandra Genis still holds a commanding lead in the race for a seat on the Costa Mesa city council dais. 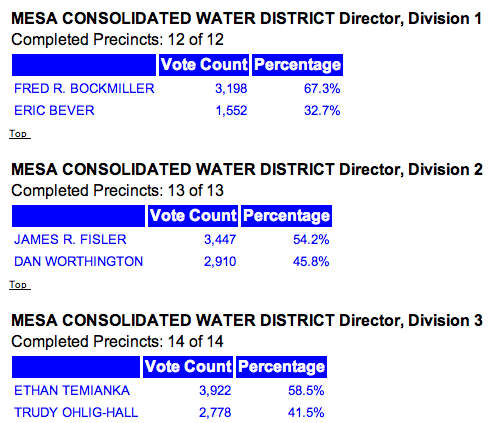 Steve Mensinger trails her by more than 1,700 votes. 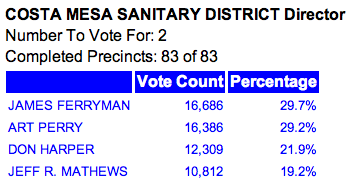 Gary Monahan solidified his hold on the all-important third seat by increasing his lead on John Stevens to 131 votes. Colin McCarthy trails Stephens by more than 350 votes. His dismantling of Costa Mesa has failed. His buddy Scotty lost 3 seats in HB. Schroeder just got popped for DUI. Baugh and Riggy are in trouble with the Lincoln Club. The OC Republican brand has lost much of its value. Its cool, we all know that Gary flip-flops from side to side and is easily managed. He sells his service to whoever will grant him protection. He's a wobbly little fella with no loyalty to anybody. And Gary just remember that you did " sign up for this". It's seems so funny that Gary was a part of the City Council that extended and actually increased the pension benefit from 3@55 to the evil 3@50 right before Mr. Righeimer took to the Council. Why did he do this? Because he was leaning towards the side that he thought would take care of him--the Unions. This guy is a joke of a local politician, not as bad as Bever, but pretty darn close. Yep, Broken Golf Cart is right. 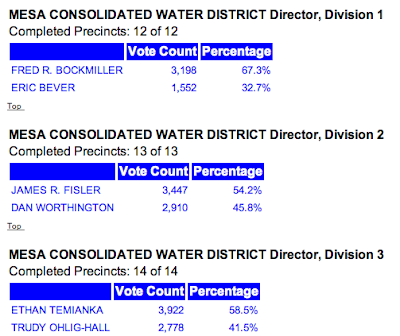 John may not have the third seat, but the water districts are safe and the council will no longer be able to silence Wendy. From now on, that council will have a very public time. Not to mention, the deep chit that Riggy is in with the Lincoln Club. You call it a victory? Not so much in reality.